While on the surface, having the kids help out with spring cleaning may seem like a good idea simply because it gets them involved with helping to clean up, it does so much more. I really believe that every child has a desire to feel part of something bigger then himself, and allowing him to take part in something that the family does together can play a role in fulfilling that desire. 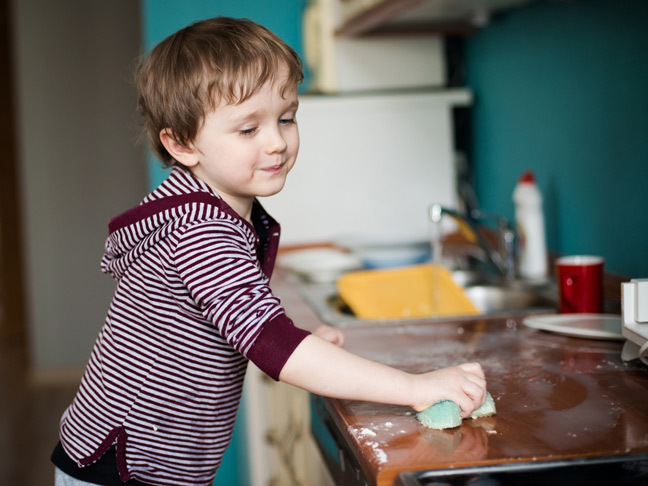 So what type of spring cleaning can you expect your child to realistically do to help out? Toddlers are great gatherers and collectors. They’re able to follow one or two step simple instructions, like “bring me all of your socks” of “take the socks out of the bin and put them in this pile.” If you are working in a specific area, your toddler will likely enjoy being your helper and bringing you the things you ask for. Preschoolers are great sorters. With simple instructions they can separate items and sort through piles. They can also do other small tasks, with supervision, like dust with socks on their hands or put books on a shelf. They can also help clean the car out, empty small trash cans and even mop small areas of the floor. Your preschooler will likely want to do the tasks “all by himself” so be sure to assign tasks that you are comfortable with him working independently on. Elementary schoolers can be given specific tasks, like to vacuum their room, and you can expect them to be done fairly well. If you put out your elementary schoolers spring wardrobe, he should be able to take out his heavy winter clothes and replace them with the lighter ones, with a little guidance and instruction. At first he may try to rush through, but with a little bit of guidance, you may find he enjoys learning new skills in the cleaning process. Middle schoolers can help rake the backyard, change the sheets, mop the floors and take part in most cleaning activities with supervision. He may grump and groan about it, but offering small rewards or positive purposeful praise may help increase motivation. Your high schooler should be able to do most tasks you assign to him with little or no supervision. He should be able to work independently with you occasionally checking in on his progress. He may try to get away with doing a less than stellar job, but gentle reminders can help him to do the job right. When getting the kids involved with spring cleaning, it’s important to discuss safety rules that go along with each task. It’s also a good idea to have your children use non-toxic cleaners and to wear gloves. While at first, it may seem like having the kids help out with spring cleaning causes you more work, once you figure out what your child is specifically able to handle, you’ll find that more hands make lighter work, and happier hearts all around. This article was sponsored by Clorox.